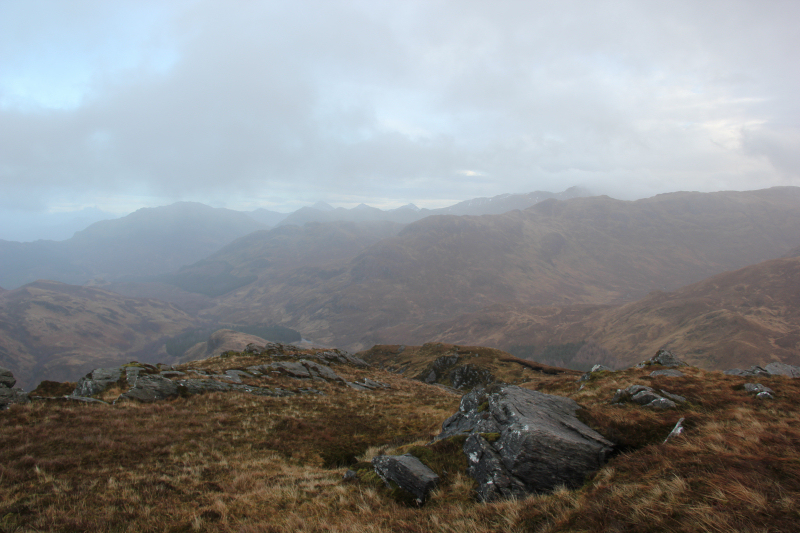 To conclude our New Year meet, I set out with Graeme, Shona and PennyTWD to ascend Beinn a’Chapuill (a Graham located near Glenelg). We both drove to, and parked at, the road end at Balvraid. Parking here is limited and cattle are free to roam beside the cars. 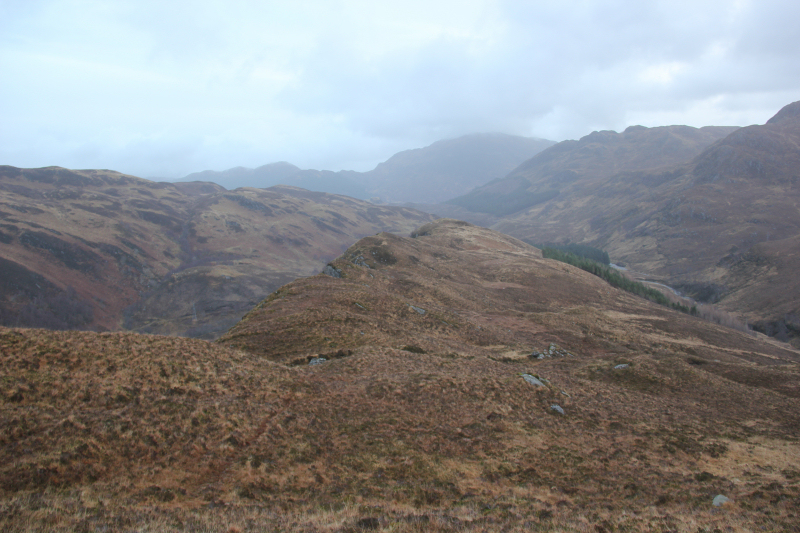 From Balvraid, we set off walking through the farm passing a number of cattle standing on and beside the track. 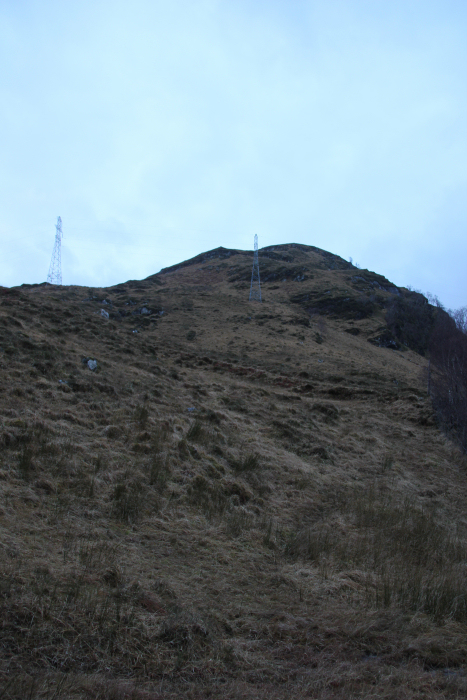 On looking at the map the night previous, I thought that the East ridge of this hill looked fairly impressive. 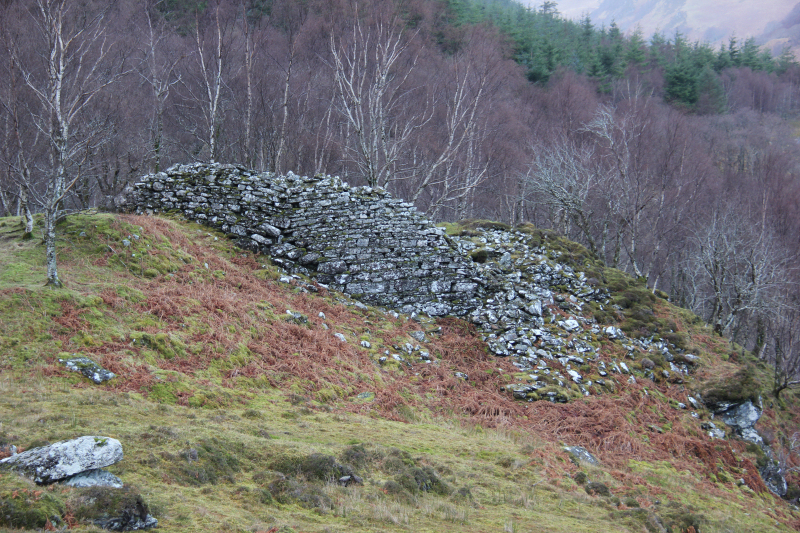 After walking circa one kilometre, we passed Dun Grugaig, which is signposted as ‘Balvraid Broch’. 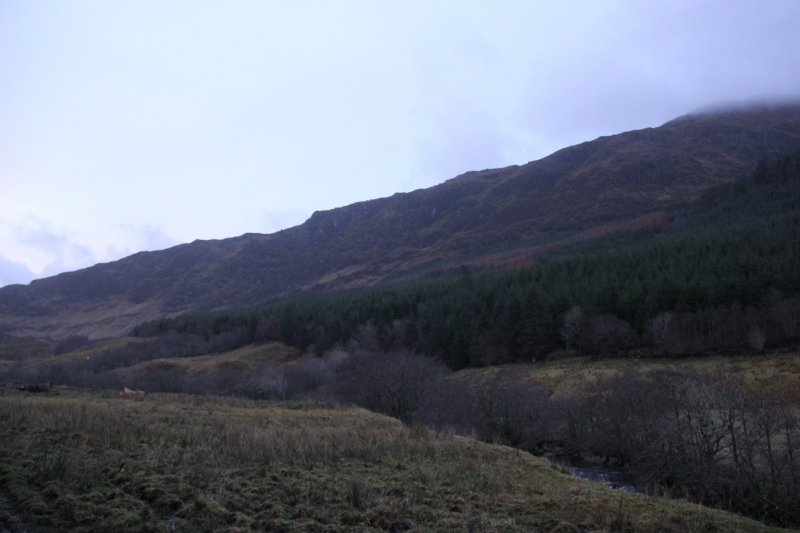 We continued along the track for a couple of kilometres with the intention of crossing the Abhainn a Ghlinne Bhig via the bridge marked on the map. 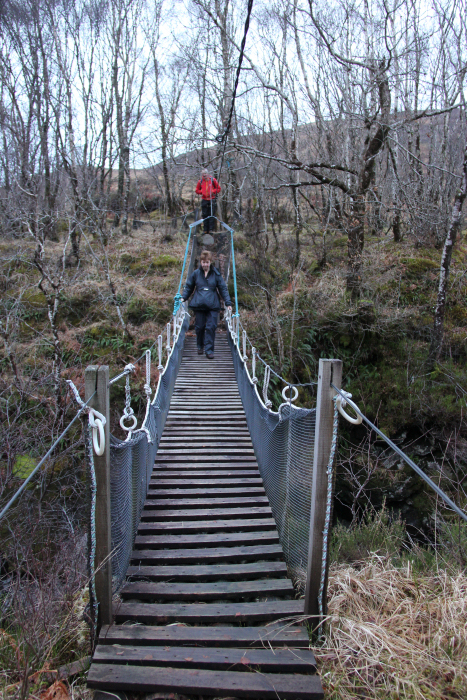 However, owing to myself and Graeme blethering during the walk-in we overshot the bridge by a couple of hundred metres. This was easily resolved with a short walk back to use the bridge. 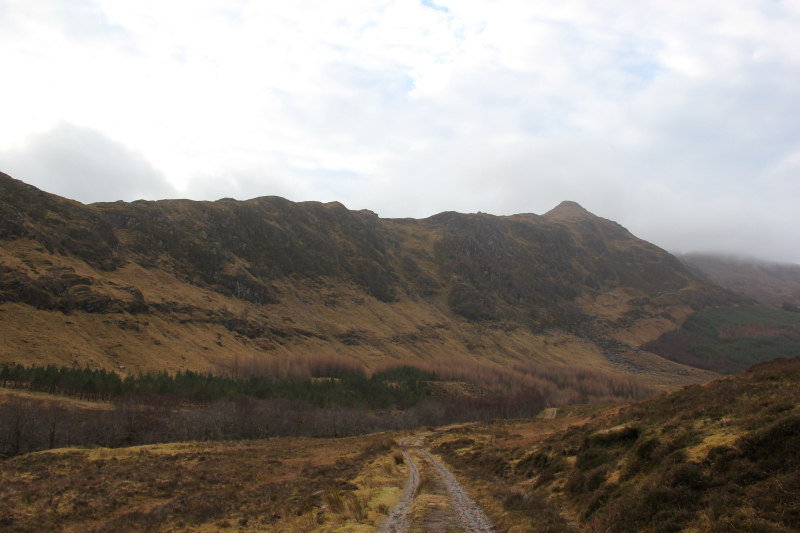 I didn’t realise until looking at the map subsequent to the walk that this track leads to Suardalan bothy. 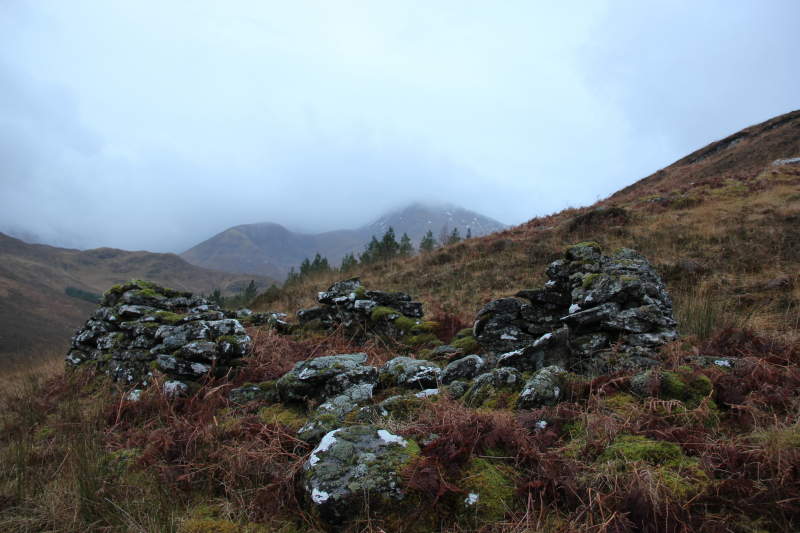 Had I realised this, I would have been keen to also visit the bothy. The bridge across the Abhainn a Ghlinne Bhig was interesting - fairly high above the water and stabilised using an overhead wire and two side wires. 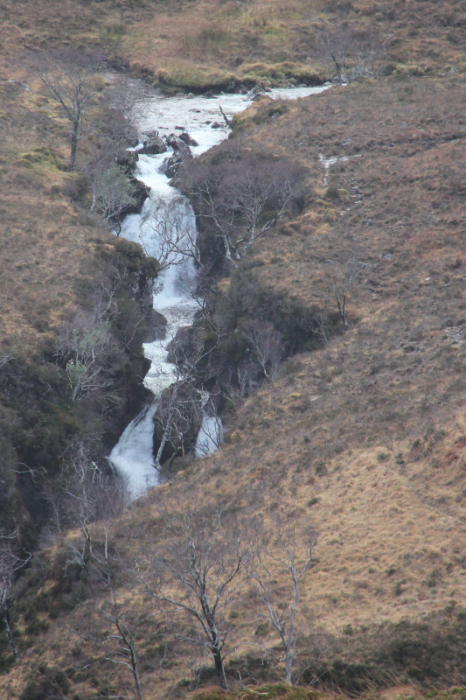 Once across the bridge, we followed the edge of a small wood, Srath a Chomair, to reach the start of the East ridge of Beinn a’Chapuill. 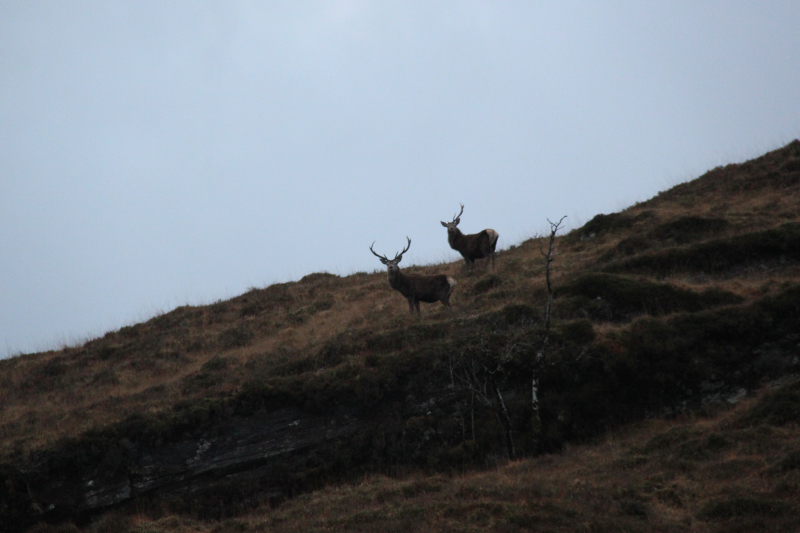 During this ascent, Shona spotted some stags above us. 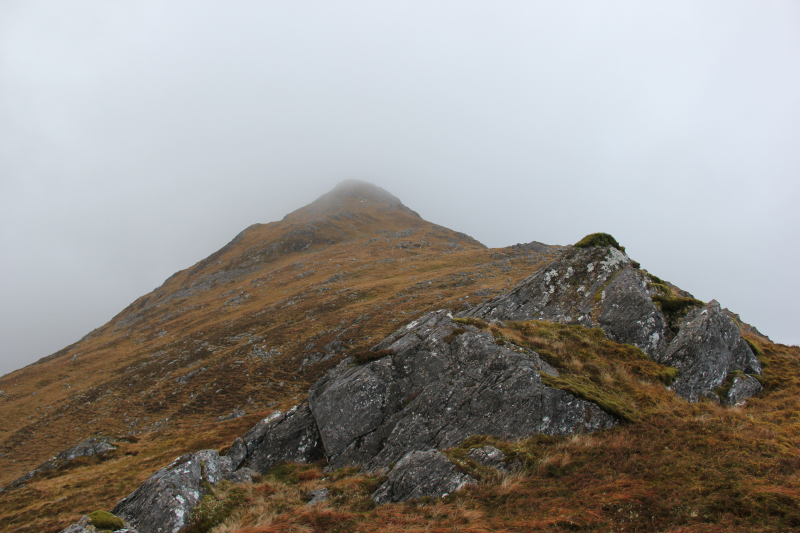 Once on the ridge, the walk was fairly straight-forward. We followed a faint path much of the way along the ridge. 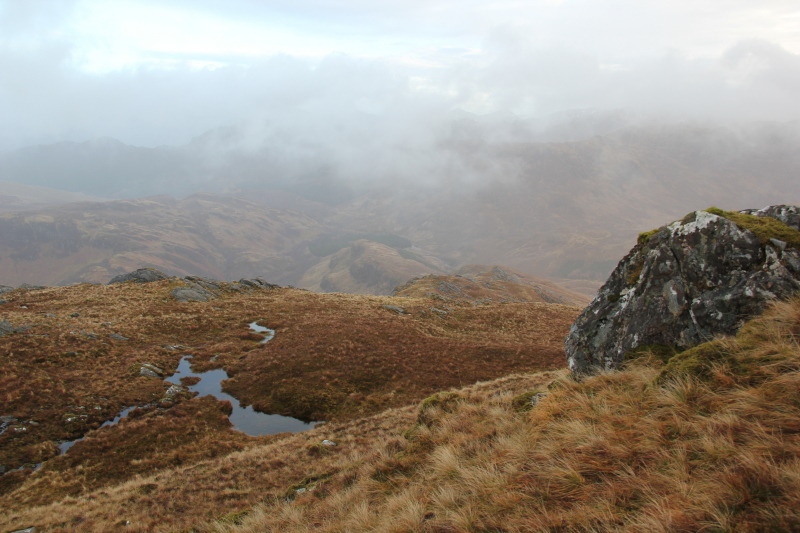 At a height of circa 350m, both Graeme and I spotted a guy with a beard on the ridge below us. One minute we saw him then he was gone. We didn’t see him again during the walk. Bizarre! There were a few steeper sections on the ridge but nothing that required hands-on. On reaching the summit area, I confirmed that we were at the actual summit using Viewranger. 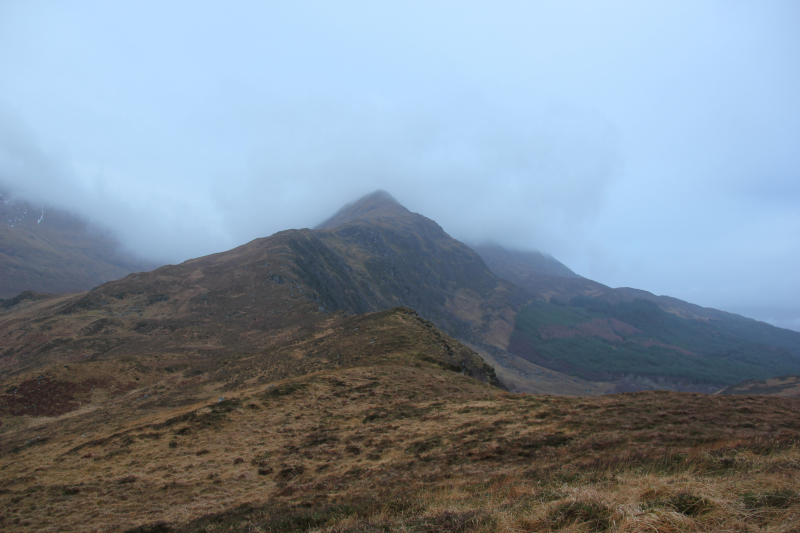 The summit is 759m, the top named on the map “Beinn a’Chapuill” is not the summit as it is only 742m. We dropped a short distance below the summit to get out of the wind and have a bite to eat before reversing our route the entire way to get back to the car. 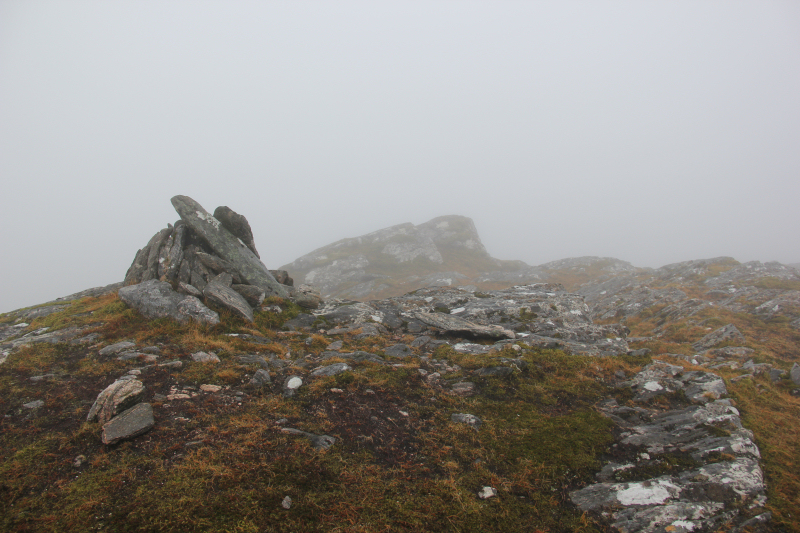 A disappointing day for views due to the clag. 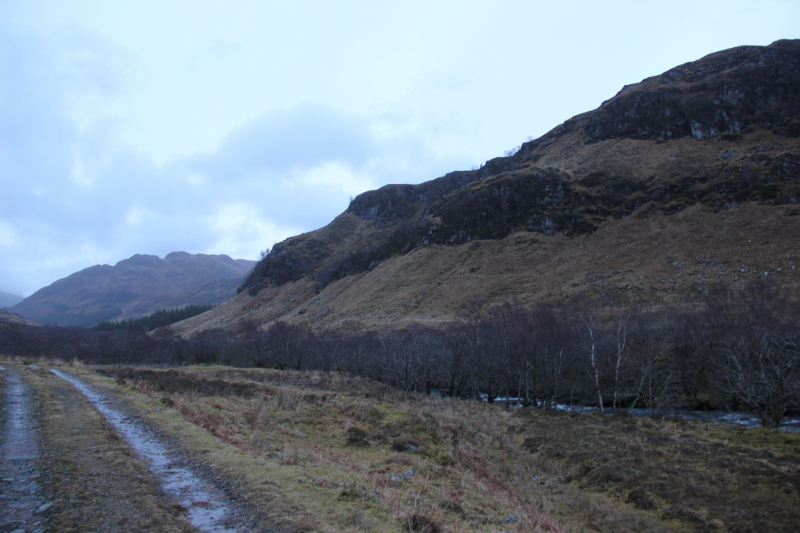 Had we ventured a bit further North and/or East we would likely have been walking in sunshine. 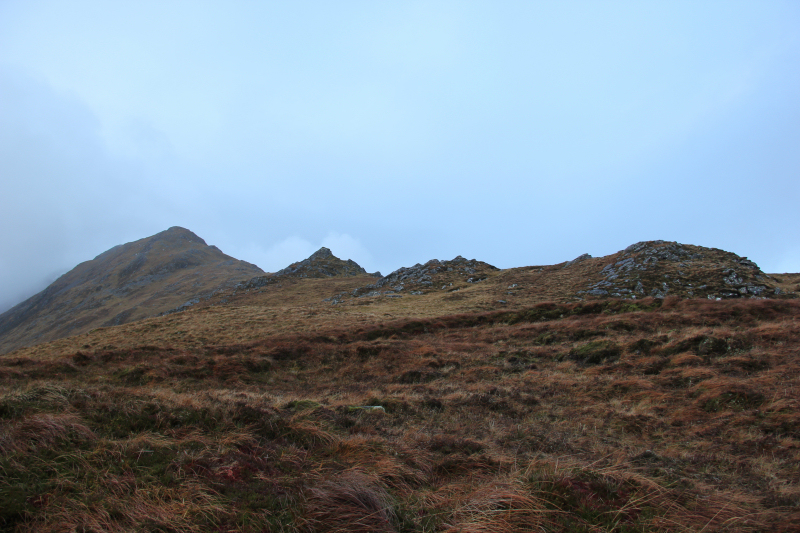 On looking at the GPS on getting back to the car, I was a bit surprised that this walk involved 1036m ascent despite the Graham only being 759m high. Another good walk in good company.